Are you having trouble transporting wet concrete to hard-to-reach areas? Our Frisco, TX concrete pumping service is your perfect solution! At Gene’s Construction, LLC Concrete & Pump Service, we have the equipment and expertise needed to pump your concrete wherever it needs to go! We’re available on short notice and provide responsive, friendly and reliable service that will keep your job running on-time and on-budget without any hassles. 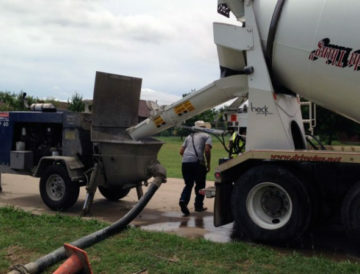 Our concrete pump can transport concrete to areas concrete mixers can’t reach, and our team handles all aspects of setup/breakdown of our equipment and operation of our pump, so you can focus on getting your job done safely and efficiently. Reduce your labor costs and eliminate the extra work of transporting concrete manually with help from Gene’s Construction, LLC Concrete and Pump! A line/trailer pump can keep your labor costs down by requiring less employees to be on the job site. The pump can go where concrete mixers cannot go. You can guide the hose as needed for each application or location for the placement and finishing of your concrete. We help you get the job done in a safe and cost-efficient manner. We accept cash, all major credit cards and company and/or personal checks. It is very important to specify to your concrete supplier that you will be hiring a concrete line/trailer pump to pump the concrete, and that we will be using a 4” diameter hose. They need to provide a mix with ¾” diameter rock. Can concrete be pumped uphill? Concrete can be pumped uphill, downhill, through small openings, across long distances, and around and under obstacles. Just let us know what you require and we will be able to help. We try our best to pump concrete supplied by the concrete company that you hire. We do not supply concrete, so it is impossible to ensure that the concrete is 100% consistent from job to job. We will, however, make our best attempt to pump the concrete mix as long as it is safe to do so. However, we are not responsible for the cost of the concrete mix if it cannot be pumped. As long as it is in our schedule for that day, we can wait for a replacement load, but sometimes it is better if we can reschedule for another day. What is the coldest temperature at which concrete can be pumped? As we have been told, our concrete pump can pump in really cold weather, however we have set our limit at 32° Fahrenheit. If the weather is below 32° Fahrenheit, we will ask to reschedule. We get our weather information through The Weather Channel.